Three huge pyramids dominate the Giza Plateau, which itself dominates the western bank of the Nile just outside Cairo. Part of what is commonly referred to as the Giza Group these evidently related monuments represent just one aspect of a vast complex of tombs, temples and other monuments, which include the mysterious Sphinx. Also known as the Giza Necropolis, the entire plateau is archaeologically and historically significant for a variety of reasons, but the largest of its three pyramids has, for thousands of years, commanded the lion’s share of attention. Consisting of an estimated 2.3 million finely dressed and carefully placed granite and limestone blocks, the largest pyramid is almost 460 feet tall, about 760 feet wide and covers thirteen and a half acres at its now decaying base. Its flanks are almost perfectly aligned to the cardinal points of the compass, and, rising at an angle of almost 52 degrees, each has an area of five and a half acres. The interior is an intriguing complex of lengthy, angled passages, dead end shafts, tiny anterooms and huge empty chambers. It is, quite literally, a man made mountain with a twist. In fact it is precisely because of this twist, and because of its size, the care & precision with which it was built, its enigmatic interior and intriguing history, that the largest pyramid is also known as The Great Pyramid. Those who have visited the Great Pyramid claim nothing prepares one for the awesome size and grandeur of a monument that, until the Eiffel Tower was built in the late 18th century, was the tallest building in the world (the pyramid remains the largest in terms of mass). Regrettably, as impressive as it is, the exterior of the Great Pyramid is but a shadow of its former glory. Once sheathed in a smooth limestone casing that was almost completely stripped away over a thousand years ago, the pyramid’s core masonry is now exposed to the elements and littered with huge divots & gashes. The top is also missing, leaving a small platform about thirty feet square at the summit. At the base, what remains of a finely crafted limestone and basalt pavement that once completely surrounded the building is now broken up and confined to a few small areas. The original entrance, just over fifty-five feet up and almost twenty-four feet east of center on the north face, has been completely destroyed. The entrance passage itself is largely intact, but what may have been a small foyer just inside the casing is now a huge indentation whose original format is impossible to discern. Just below & to the west of the entrance, in the center of the north face, a roughly carved tunnel (a forced entry by 9th century treasure seekers) extends about one hundred feet into the building where it merges with the original entrance passage. Perhaps the most enigmatic exterior feature of the Great Pyramid is its truncated top (Figure 1a - at the end of this article). About twenty-four feet short of its true apex, the flat top has fascinated visitors and researchers alike. There has been much debate as to whether or not the pyramid ever had an apex or capstone, but both historical and recently gleaned mathematical evidence indicate the casing was also truncated. If there ever was a capstone (unlikely but possible), it was almost certainly designed in such a way as not to detract from the height of the main body. In direct opposition to the intimidating exterior, the pyramid’s interior is cramped, limited and confusing. Angled passages, empty, unfinished chambers and a curious mixture of both blocked and open “air” shafts (two of which are now used for modern day ventilation) present a puzzle that has challenged minds as great as those of Napoleon and Isaac Newton. The pyramid’s barely navigable interior passages (imagine climbing into the back of a station wagon hundreds of feet long) are perfectly aligned north/south, but, like the entrance, are slightly east of the north/south axis. Each of the chambers are at different levels and are of differing shapes & sizes, but all extend west from their respective passages and all feature small shafts, niches and/or other as yet unexplained anomalies. For easier understanding, the pyramid’s interior can be divided into a lower and apparently unfinished section, and a far more complex upper section, which houses the most enigmatic and studied features. Curiously, the interior of the pyramid was originally accessed by a single, concealed entrance, with access to the upper passages and chambers further concealed, even from those who, many years ago, were aware of, or perhaps even familiar with the lower interior. The original entrance (Fig.1b) opened into the Descending Passage (Fig.1c), which angles downward through the pyramid’s core masonry and into the bedrock below, where it levels out and terminates just beyond a huge Subterranean Chamber (Fig.1e). The mechanical details of the concealed door and the exact configuration of the entrance were lost, along with the casing, over a thousand years ago. The best we can possibly do now is to assume that, once the location of the entrance was known, the door (reportedly a hinged stone) would be relatively easy to open and close at will. Despite the damage to the entrance, the interior remains largely intact and provides a wealth of information, even in areas where it is now less than perfect. When entering the pyramid in the normal way (tourists now enter via the forced passage at the foot of the north face), one is obliged to contemplate the remains of the original entrance before entering the Descending Passage (Fig.1c). This four-foot square, perfectly straight and almost featureless passage plunges through the core of the pyramid and into the bedrock, at an angle of about 26.5º with a deviation of less than a quarter of an inch over more than three hundred and forty feet. About 40 feet down the passage, joints in the core masonry suddenly change from perpendicular to the passage axis to sharply angled. The reason for this sudden change is almost certainly to draw attention to Scored Lines (Fig.1d) that appear perpendicular to the axis of the passage. There are no other features here, no obvious or apparent reason for the presence of the scored lines and no indication as to why the pyramid’s designer wished to draw attention to this area. Almost a hundred feet down, the masonry joints change once again and the floor of the passage changes to a harder stone. Here, the bottom of the similar Ascending Passage (Fig.1g) is blocked by three huge granite plugs, which were originally concealed by part of the Descending Passage ceiling. This area is extensively damaged, with the softer core masonry broken away to bypass the granite plugs (discussed later). Farther down the Descending Passage, a roughly carved opening in its west wall leads to an equally rough, almost vertical Well Shaft (Fig.1f) which makes its way up through the bedrock and back into the core masonry to emerge at the top of the Ascending Passage (also discussed later). Deep in the bedrock, the Descending Passage levels out, becomes slightly smaller and proceeds to a large, evidently unfinished Subterranean Chamber (Fig.1e). The ceiling and walls of this chamber appear to be finished, but the floor is a complex jumble of highs and lows which resemble, at the western end, mountain ranges separated by a deep valley, and, at the eastern end, a flat plain with a deep, rectangular pit in the floor (a model railroad would not look out of place here). Both before and after the Subterranean Chamber, the horizontal passages exhibit anomalies that, although apparently unfinished, hint of some arcane purpose. Prior to reaching the Subterranean Chamber, the horizontal entrance passage passes through an approximately six foot square ante-room carved into its ceiling and west wall (that is to say, the floor and east wall of the passage continue more or less undisturbed). The ceiling of this ante-room is angled & extremely rough, and, were it not for the precise carving of the walls and the uniform shape of the room itself, one might be tempted to assume that this area simply collapsed during excavations. Beyond the Subterranean Chamber, a much smaller horizontal passage extends for over fifty feet. This passage is as straight as any other in the pyramid but features a curious kink to the west just before returning to its original heading and then terminating in a dead end. The top end of the Well Shaft (Fig.1f) was discovered soon after the pyramid was first opened in 820 AD, but it was almost completely filled with rubble and not properly explored until it was cleared in the 19th century. Since it was cleared, a number of comparatively minor purposes have been proposed, but the existence, part way down, of an additional feature, known as The Grotto (Fig.1f), carved into the bedrock just below the pyramid’s core masonry, tends to indicate a much more important function. The Grotto consists of two small rooms, which house only an enigmatic pit and a large block known as the Grotto Stone (which has now tumbled into the pit). The Grotto Stone is reputed to contain a number of bore holes in one end (now evidently inaccessible) which may or may not contribute to our ultimate understanding of the pyramid, or at least this area of it. Indeed, the fact that it would be extremely difficult, if not impossible, to remove or “lose” the Grotto Stone (the fate of many Egyptian artifacts in the past), may, in itself, prove to be of some importance. Located approximately one third of the way down the Descending Passage, the similarly sized and angled Ascending Passage (Fig.1g) climbs 146 feet through the core masonry. Plugged at the bottom by granite blocks, which fit with a high degree of accuracy, this passage was accessed by tunneling through the adjacent, but softer limestone core. Here too, passage joints appear to be designed to draw attention to a number of anomalies - in this case three equally spaced, vertical Girdle Stones, which the passage actually passes completely through on its ascent to the Grand gallery. At its top, the Ascending Passage suddenly opens into what is consistently described as the most magnificent example of ancient world architecture. The Grand Gallery (Fig.1h) is a 153-foot long, 28-foot high passage that continues upward, at the same 26.5º angle as the Ascending Passage, into the very heart of the pyramid. The Grand Gallery consists of a narrow channeled floor between two high steps or ramps, and corbelled (stepped inward) walls that reduce its seven-foot width just above the ramps to less than four feet at the curious stepped ceiling. Half way up the side walls, and for the full length of the Gallery, small grooves run parallel to the corbelling. And, where the base of each wall meets the ramps, 28 sets of angled depressions and stone inserts line the Gallery at equal intervals. Once again, numerous functions have been proposed, both for the grooves and for the depressions & inserts, but their true purpose remains a mystery, as does the presence and grandeur of the gallery itself. At the top of this giant ramp, lies the three-foot high Great Step, which must be surmounted to gain access to the pyramid’s most enigmatic, celebrated and studied feature. Beyond the Great Step, a short passage leads to a small Anti-Chamber, and finally, via a second short passage, into the King’s Chamber (Fig.1k). This large rectangular room was constructed using huge granite blocks, some weighing an estimated 70 tons (a modern airliner can weigh up to 100 tons). The floor, also consisting of granite blocks, is actually seated between the walls, which extend to approximately five inches below the floor line. A detailed inspection of the King’s Chamber indicates it was constructed entirely separate from the pyramid’s core, and that it can move independently, presumably to avoid being crushed or damaged by subsidence or earth tremors. Small (approximately 8” square) “Air Shafts” extend from the north and south walls of the King’s Chamber, penetrating to the exterior of the structure as it now stands. (It remains unclear if these shafts penetrated the original casing – see A History in this section - but, these days, they are used to ventilate the King’s Chamber in the normal way). Above the King’s Chamber, five Construction or Relieving Chambers appear to have been designed to protect the main chamber from the weight of the masonry above. Back at the junction of the Ascending Passage and the Grand Gallery, a Horizontal Passage (Fig.1i) continues south through a vertical wall that was designed to be concealed by a ramp set into the lower extreme of the gallery floor (but evidently never installed). Similar in size to the angled passages for most of its length, the Horizontal Passage suddenly increases in height via a stepped floor prior to entering the Queen’s Chamber (Fig.1j). Almost square with a gabled roof, the Queen’s Chamber features a large “Niche” in its east wall. In relatively modern times, a small, rough tunnel was forced through the rear of the niche and this extends for approximately 30 feet. The Queen’s Chamber also features small Air Shafts which extend out and up from the north and south walls but which do not penetrate to the exterior (and, until opened in the late nineteenth century, remained concealed behind the perfectly smooth chamber walls). At almost 460 feet tall, the Great Pyramid is more than one third the height of New York City’s ill-fated twin towers, and its thirteen and a half acre base would cover more than 80% of Ground Zero. In fact, until the Eiffel Tower was built, in 1889, The Great Pyramid was the tallest building in the world - a record it had held for well over four thousand years. Today it is the only surviving Wonder of the Ancient World and, so surely does it continue to command our attention, that it is reputed to be the second most written about subject on the planet. Figure-1: The interior of The Great Pyramid as viewed from the east side. The passage system lies almost 24 feet east of the pyramid’s north-south axis and all three major chambers extend to the west from their respective entrance passages. 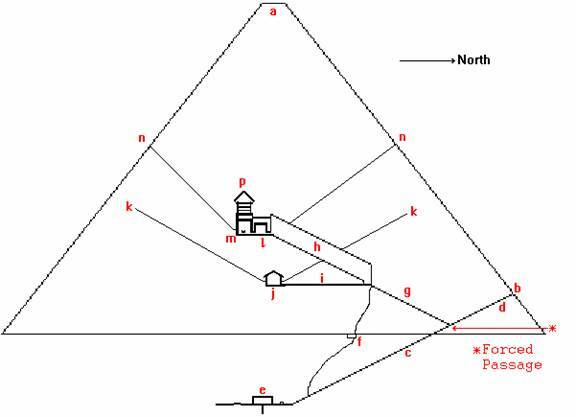 Note: This article is intended only as an introduction to The Great Pyramid; a complex and much studied monument. For the serious scholar/researcher, there are numerous works, which supply additional and/or more detailed information – consult the web, your library or local bookstore.